Thoughts drift, in no particular order.mass and orbit finding your own centre. What are you rotating around? What is the core that you move around? How do we reorganise ourselves in relation to gravity from horizontal to vertical?… the constantly shifting axis of our centre, a constantly shifting relationship to down and up, to what is falling and what is rising. Can we keep that sensation of motion, of fall and rise, moving? Following the heavy part as it rolls and riding the momentum of the motion. We set something in motion – really moving and just stay with it, with no prejudice about direction or possibility… we allow ourselves not to know, and in not knowing everything is possible – because we haven’t done any of it yet – it’s a commitment to keep saying yes to wherever the dance is taking you. Working with the eyes closed is a way for us to heighten the other senses.. to notice the other senses that are guiding us.. and, in particular to rely on the internal sensing – the senses which are less judgmental – the ones not full of code… how to say? Seeing is an internal sense too – it’s just that we think it’s not. Seeing is a projection – a reading and interpretation of the world by each individual. We really do see the world differently from each other – and the same.But seeing is a sensation – it is a sense – personal to us. Working with the eyes closed gives us an opportunity to shelve some of our habits of perceiving and to explore a different route into perceiving. 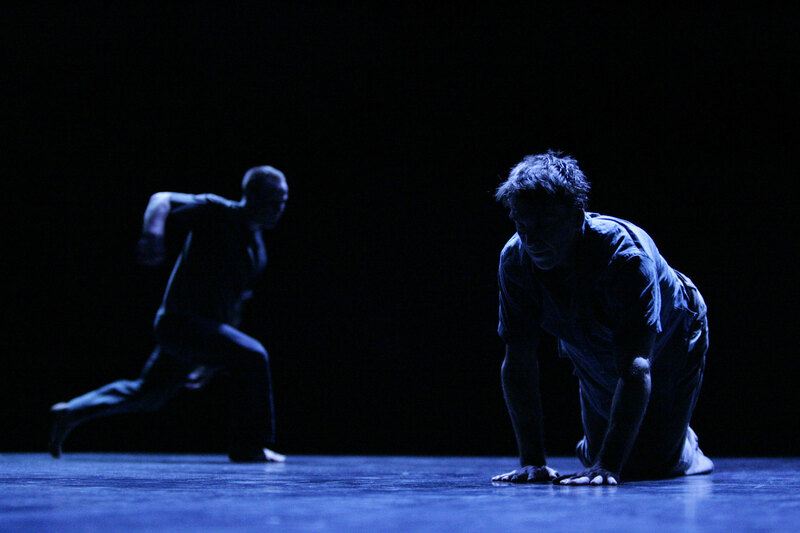 One which is especially useful for dancing – in general and for Contact Improvisation – maybe in particular. With the eyes closed, the eyes become just another muscle.. another set of muscles – another set of sensations to be felt. There is a great equality when it comes to sensation –our sensations are less attached to names and labels than what we see – I find that sensation is a moment to moment journey – one which is here and now. When I open my eyes, I am more likely to wander beyond the here and now. Makes me think of the time just after waking up (if I’m relaxed) where things come into my vision and the sense of seeing is new again… there are colours and shapes, and there is depth and texture, but those things can simply be (those things are experiences rather than names)– they have (inadequate) names, but the name is secondary to the thing rather than its primary quality or – the first thing I notice about it first it is shape and colour and then it becomes the tree outside my window against the sky. We are alive, and it’s easy to forget to enjoy the animal that we are… the things we feel and see – the sensation of sight, of colour, of texture, of proximity and distance. A name is a way for us to ignore something – to ignore what it is, or to not have to consider it – a name is a convenience – and sometimes a shorthand for the thing named. Sky – a name and all the things that might be contained within that.In contact with another person– so much is about the contact is about feeling rather than seeing – feeling the ground beneath us, feeling the flow of weight in relation to gravity, feeling the ground move with you on it. Movement is experienced so differently by each of us – there is a value in that, listening to our own experience and articulating it in relation to the experience of others – in performance, this is what we do (?) – we articulate or explore something about our own experience. It can be so easy to try to imagine what the experience of seeing us articulate or explore that experience/thought/idea, is for others, but maybe we will never know, and there’s a danger that by projecting an idea of what others will see, we will lose the essence of whatever it was/is that we were interested in in the first place. I think my train of thought just left the station without me. I’ll wait for the next one.